This last Thursday was a long and complex, if productive, day. The ultimate goal: sell off some cameras to make more room on the shelves. I’m getting there in a roundabout way. I started my day in one of the worst ways you can: mourning the death of a colleague. Colleen O’Connor was a beloved member of our newsroom for more than a decade, skilled beyond my comprehension in bringing out the humanity in any story, and taking them all on cheerfully. Full of a soulful grace and humble curiosity, Colleen eagerly dove into anything and responded to changing demands and a changing industry with a lot of drive to learn and adapt. Tragically, Colleen was struck and killed by a motorist while crossing Speer Boulevard in Denver Wednesday night. Alcohol is being investigated as a factor in the accident. Kevin Simpson’s obituary for Colleen is emotional and contains video remembrances from a number of Denver Post newsroom staffers. Colleen’s gentle charm and radiant smile will not soon be forgotten. After sifting through the myriad Facebook and Twitter mentions, and reading the stories we’ve posted, I got on with my day. I feel like Colleen was the soldiering-on type, too. I dropped off our recycling and compost, had a “picnic” lunch with Kate in the park by her library, and picked up a new clutch pedal pad for the Jeep. Next on my list was trying to photograph some kits of cameras and accessories I wanted to sell. Since I was close already, I thought I might try to instill a bit of adventure into my pictures with a map for a prop and a view of the city from Lookout Mountain. Unfortunately, I wasn’t actually looking at said map, and I missed the turn. But Red Rocks Park was close, too, so I turned in there. I hiked up to the geological overlook — a short but very steep trail — and took some pictures there. Sadly, my phone succumbed to the “screen freaking out” bug that’s affecting many other iPhone 6s all of a sudden, and I didn’t get everything fixed quite right. In the brilliant sun I couldn’t tell that half my photos were wildly out of focus. I managed to find some good ones here, but the group photo of the first kit I’m offering up is not the way I’d like it to be. I’ve included it to show what’s included in the kit, however, and have more detailed images of the individual pieces. With all that out of the way, let’s take a look at the great deals I’m offering! Kit I: Pentax Spotmatic + lenses SOLD! Excellent condition. Shutter speeds accurate. Meter accurate. Tiny dent in corner of pentaprism housing (does not affect performance), minor scuffs on bottom plate. Excellent condition. No fungus or scratches, very minor internal dust (does not affect images). Aperture moves freely and blades are oil-free. Includes UV filter and lens cap. Excellent condition. No fungus or scratches, very minor internal dust (does not affect images). Aperture moves freely and blades are oil-free. Includes Skylight (1A) filter, Vivitar-branded front lens cap and rear cap. Excellent condition. No fungus or scratches, very minor internal dust (does not affect images). Aperture moves freely and blades are oil-free. 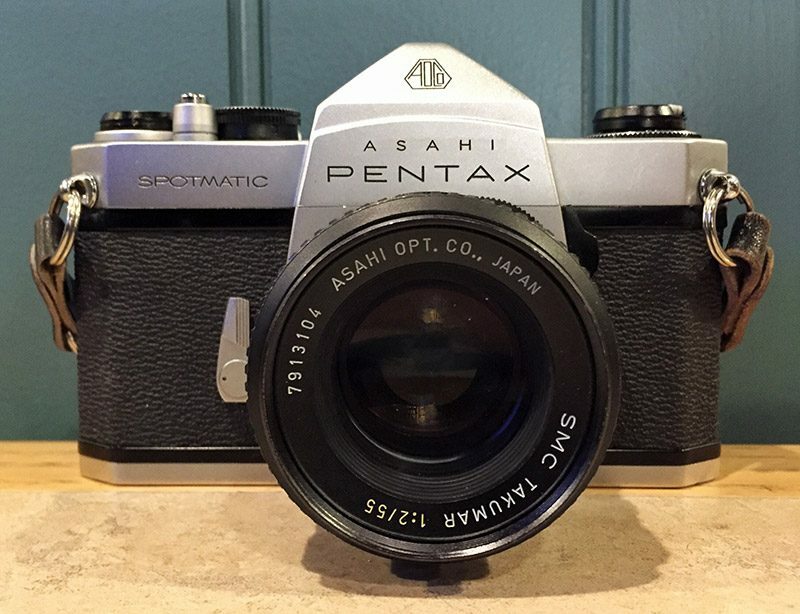 Includes original Asahi Pentax front and rear caps. Provides a cold shoe for flashguns and other accessories. Very high-quality strap with velour lining so it stays put on your shoulder, film canister loops, and large leather pads to protect the camera body from the strap hardware. Has quick-disconnect buckles, as well. Overall, I think this is the best value kit I’m offering. For a student or beginner, or someone looking to make the jump to m42 Pentax cameras, this has a lot of range and versatility. Most of the kit in very good to excellent condition cosmetically, and everything works just as it should. I believe this kit represents about a $150 value, in terms of what it would cost to get these pieces separately, not including shipping. Price includes shipping to the continental U.S.; international buyers will have to cover actual shipping. Contact me to make an offer. Kit II: Pentax Spotmatic + lenses SOLD! Excellent condition. Shutter speeds accurate. Meter accurate. Minor scuffs on bottom plate. Excellent condition. No fungus or scratches, very minor internal dust (does not affect images). Aperture moves freely and blades are oil-free. Includes front lens cap. Excellent condition. No fungus or scratches, very minor internal dust (does not affect images). Aperture moves freely and blades are oil-free. Includes Skylight (1A) filter and lens caps. Good condition. No fungus, one small scuff on front element that does not seem to affect images, very minor internal dust. Does have obvious wear on the outer surfaces and a dented filter ring. Aperture moves freely and blades are oil-free. 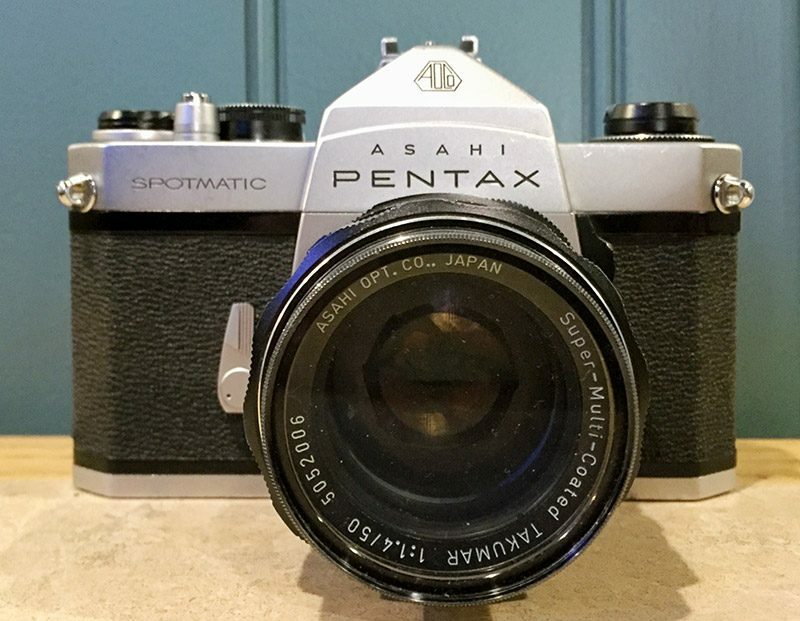 Includes original Asahi Pentax front lens cap. Velour lining keeps it in place on your shoulder, and vintage leather and embroidered patterns add dozens of style-points to this kit. Very good condition. Two-piece design includes a half-case the mounts to the camera body, and a captive, but removable, top/front cover. Allows camera to be carried in case. Case features full-grain leather and an Asahi Pentax “AP” logo badge. Good condition. This kit is also an excellent beginner kit, with a good selection of lenses and accessories to get a student or film convert started quickly. While not everything is absolutely perfect, there’s nothing here to stop you from making plenty of great pictures. I believe this kit represents about a $115 value. 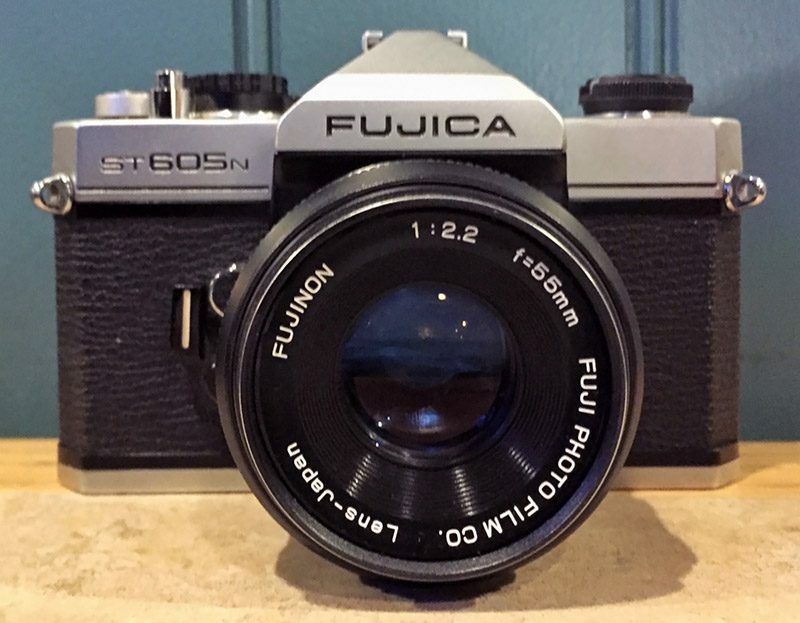 Kit III: Fujica ST605n + lenses SOLD! Excellent condition. No fungus or scratches, very minor internal dust (does not affect images). Aperture moves freely and blades are oil-free. Includes UV filter. A surprisingly good lens from an off-brand. Excellent condition. No fungus or scratches, very minor internal dust (does not affect images). Aperture moves freely and blades are oil-free. Includes rear lens cap. Another high-quality third-party lens. Excellent condition. No fungus or scratches, very minor internal dust (does not affect images). Aperture moves freely and blades are oil-free. 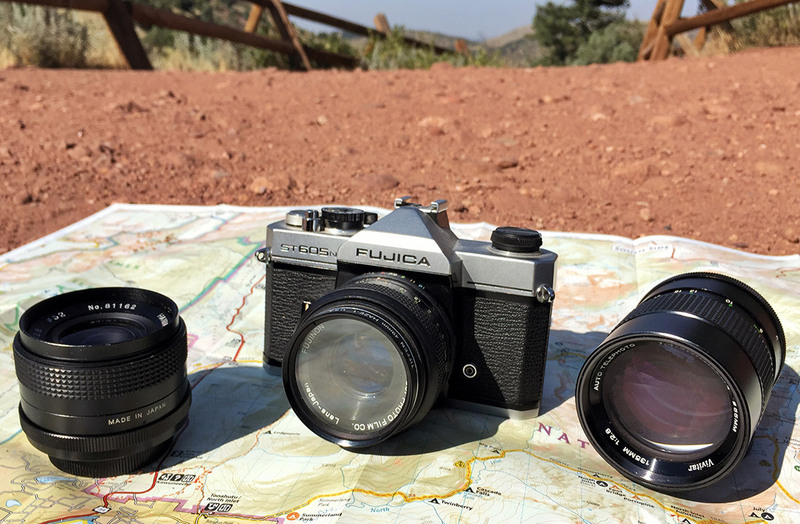 Includes original Vivitar front and rear caps and Tiffen Haze+UV filter. A narrow strap with rubber grip threads running through it so it stays put on your shoulder. Very secure mountings. This kit would be fantastic as a gift to get someone back into film, for a student, or for someone wanting to play with m42 lenses. The ST605n is a surprisingly good little camera for being otherwise unremarkable. The Vivitar 135mm lens is prized for beating most mainstream manufacturers’ m42 135mm lenses for years with its larger maximum aperture and superb optics. 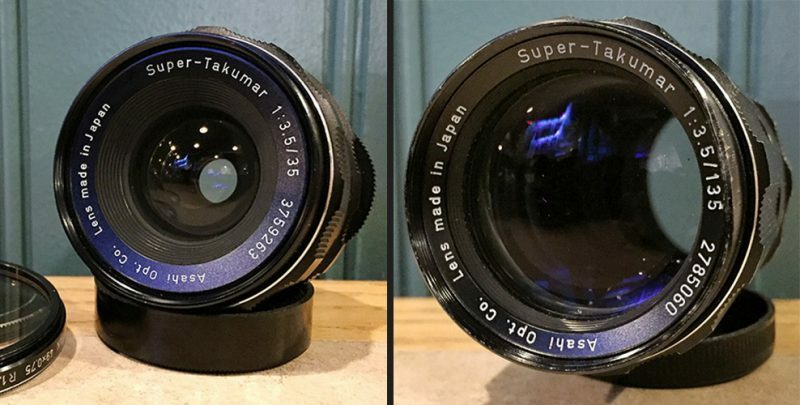 It may be worth mentioning that all these lenses are made in Japan. I believe this kit represents about a $75 value. 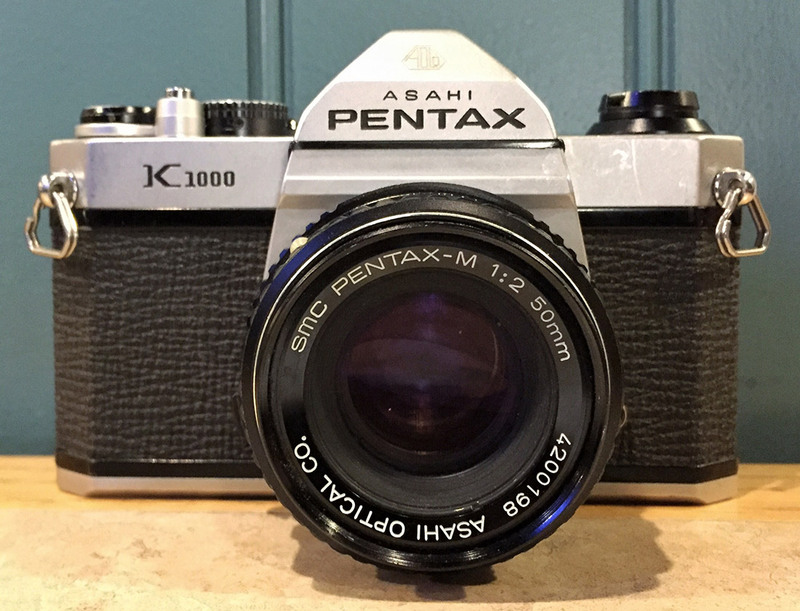 Kit IV: Pentax K1000 + lens SOLD! Good condition. No fungus or scratches, very minor internal dust (does not affect images). Aperture blades move freely and appear oil-free, but have marks (rust?). The classic beginner SLR, this all-manual, all-mechanical workhorse is still a great way to get decent pictures without a lot of complicated menus and options. Perfect for any student. I believe this kit represents about an $75 value. 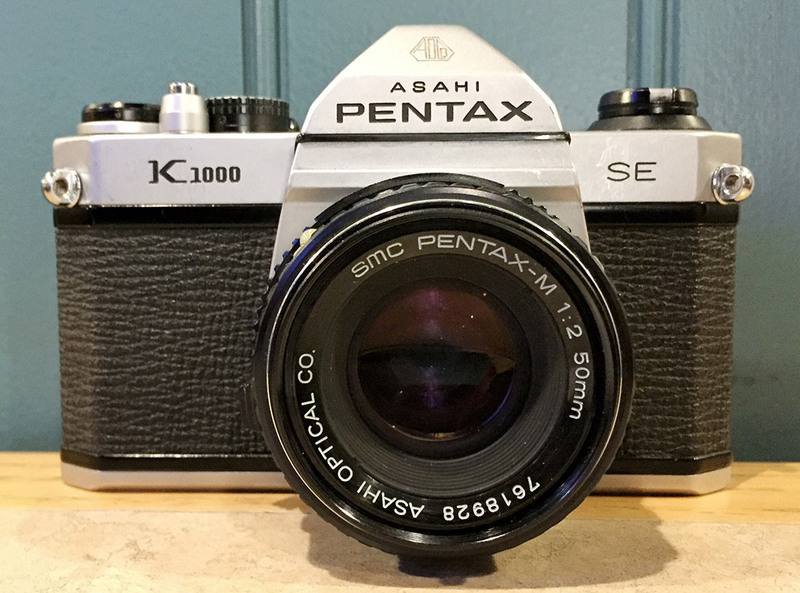 Kit V: Pentax K1000SE + lens SOLD! SE = Second Edition. Excellent condition. Shutter speeds accurate. Meter accurate. Minor scuffs on bottom plate. Excellent condition. No fungus or scratches, very minor internal dust (does not affect images). 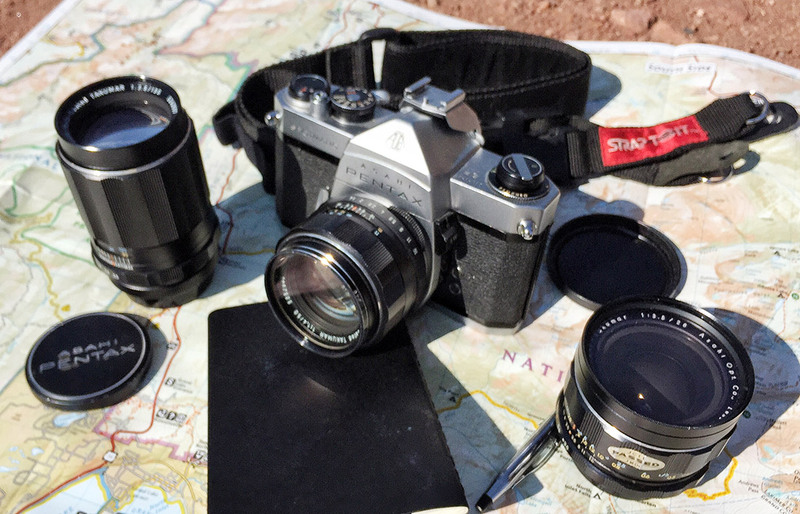 Aperture moves freely and are oil-free. The second-edition K1000 adds a split-image focusing aid inside a microprism ring (the Spotmatics and original K1000 above have only a microprism patch in the center of the focusing screen). One little change that can make a big difference to some users. Still just a superb student camera with which to get into (or back into!) film photography. I believe this kit represents about an $80 value. Kit VI: Olympus XA2 + flash SOLD! Near-mint condition. This camera hardly appears to have been used. Meter works and is accurate. Lens is free of fungus and scratches, shutter and aperture blades are oil-free and function smoothly. Near-mint condition. Charges quickly and fires correctly. This would be a great companion to anything above, and is perfect for hiking or biking. A tiny powerhouse with a stunning Zuiko lens, the XA2 fits into nearly any pocket and features a very good auto-exposure system. Simply choose your focus range for portraits, groups or scenes, and touch the shutter release to make a picture in almost any conditions. The flash isn’t very powerful, but it’s enough for a lot of indoor situations, and it’s great for getting that 1980s look to your party photos. I believe the XA2 in this condition represents about a $50 value. I’ve got a lot more cameras than I know what to do with, and need to clear space. I’m literally tripping over them. I’m willing to combine kits above, or mix-and-match components as long as everything in question is still available. Please consider buying your friends and family members a film camera for Xmas, fall birthdays, or any other upcoming holiday you celebrate. Or just because — film is great for that! Additionally, if you’re seeking something different, check out my list of other cameras for sale, or contact me — I may have just what you’re looking for, and believe me, I need the space! I can’t vacuum my house!